This week’s Train Thursday image is from 1981. Alan Boyd, President of Amtrak, Lieutenant Governor James Fitzmorris, and Mayor Ernest Morial preside over the return/re-dedication of the City of New Orleans train line. The train, provided service between Chicago and New Orleans. The Illinois Central RR started the service in 1947, as a daytime complement to the railroad’s Panama Limited train. The Panama Limited was an overnight service, and the City of New Orleans operated as a day service. The overnight train made fewer stops, but the daytime service stopped at many small towns along the route. When Amtrak took over in 1971, the company initially operated the City of New Orleans on the daytime schedule, but shifted it to night service after six months. They re-named the train to the Panama Limited. 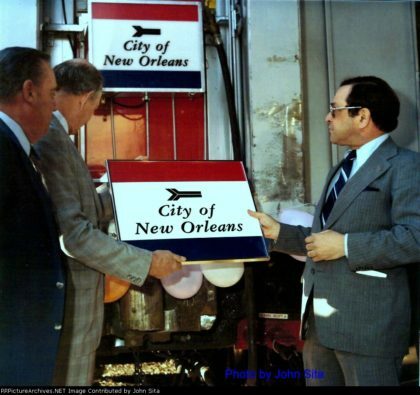 Amtrak changed the name back to City of New Orleans in 1981. They wanted to cash in on the popularity of Arlo Guthrie’s version of the song about the train. The company retained the overnight schedule, in spite of the name change. The City of New Orleans ran consistently from 1981 until Hurricane Katrina, in 2005. Amtrak cancelled service south of Memphis in the wake of the storm. As New Orleans recovered from Katrina, service was first restored as far south as Hammond Louisiana. On October 8, 2005, the City of New Orleans continued from Hammond, across the western side of Lake Pontchartrain, then into the city. The current Amtrak timetable for the City of New Orleans has the train departing New Orleans daily at 1:45pm, arriving in Chicago at 9am the next morning. The return trip departs Chicago at 8:05am, returning to New Orleans the next day at 3:32pm. Amtrak’s route guide for the train provides more details about the journey. Train Thursday is going to be a thing for the two websites, since New Orleans has been an important railroad hub for over 150 years.